When it rains, it pours — or so the saying goes. If you’re not in the greatest place financially, it can feel like everything is going wrong at once. Well, let us pop open a metaphorical umbrella and help you out. Things like poor credit and high debt can make it seem pretty much impossible to find a lender who will give you a home loan. But financially speaking, buying a home is a better investment than continuing to rent perpetually, so what are you to do? This is where learning a bit more about the ins and outs of mortgage financing can help you out. If you have financial struggles like a low credit score, low income, and/or high debt, the conventional mortgage may not be the best option for you. Not to worry! 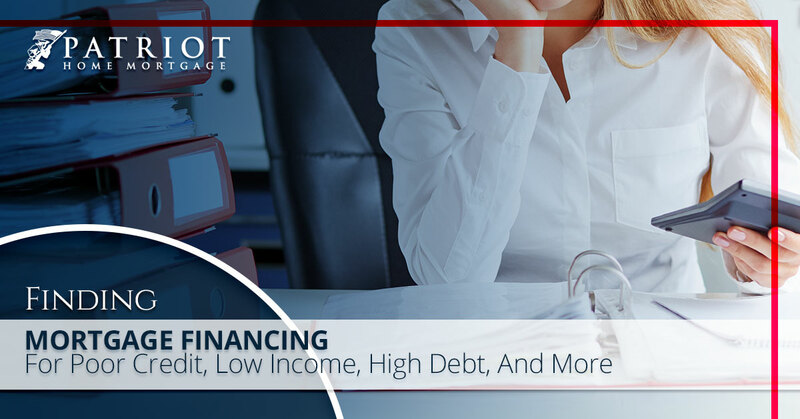 There are mortgage financing options out there to help those who don’t fit into the mold of perfect finances. First, before we dive into your options, we want to clarify something. You can absolutely talk to a lender without committing to a loan. In fact, we highly suggest talking to a couple different lenders or a mortgage broker because the more people you talk to, the wider range of loan options you’ll learn about. This can be a great way to see whether some lenders have lower credit score requirements or offer special assistance for low-income buyers. There was a widespread worry that talking to multiple lenders would pull your credit score too often and “ding” your credit. That’s not the case! Lenders will do what is called a ‘soft pull’ when they look at your credit, so talking with multiple lenders won’t harm your credit. And, these days, the credit reporting agencies tend to look at a mortgage as ‘good debt,’ so they aren’t about to penalize you for trying to make a good investment like buying a house. So, the important takeaway here is to talk to mortgage financing experts! Lenders and brokers are there to provide education as well as financial assistance, so even if they don’t have the right loan option for you, they may know of other options that would work. The FHA loan is actually mortgage insurance provided by the Federal Housing Administration. Basically, it’s insurance that allows approved lenders to loosen up on their loan qualifications since they have a guarantee from the FHA that they’ll get paid, even if the borrower can’t pay. This allows lenders with lower credit scores — at 580 and up with a 3.5 percent down payment, or down to 500 with a 10 percent down payment — qualify for a loan. The FHA loan also allows the entirety of your down payment to come from gifted money, which other loans don’t allow. This way, if you’re just starting out but you’ve got family willing to help you out, the FHA loan can help you make it happen. Generally when most of us hear USDA, we tend to think of farming. In this case, you’re not far off. The USDA offers mortgage financing to encourage home buying in rural areas, especially for those who don’t have a large income — like farmers. There are some credit score requirements, but the USDA loan doesn’t require a down payment and it offers reduced mortgage insurance. However, there are geographical restrictions. For those who are eligible, the VA home loan is a great option. There is no down payment requirement — and no mortgage insurance requirement. Plus, the loan accepts those with credit scores as low as 600. Of course, you do have to be eligible for this benefit through the VA. There are other options as well. The best way to figure out the right loan option for you is to start by talking to someone who knows about mortgage financing. Here at Patriot Home Mortgage, we’re happy to help you explore your options and learn more. Connect with us today!